Cristiano Ronaldo will sit out Portugal's Nations League clash with Italy to continue training with Juventus during the international break. But how is the forward faring in Serie A? After his World Cup exploits, the five-time Ballon d'Or winner is hoping to refine his fitness ahead of Juventus' Champions League clash with Valencia on September 19. How has he been performing? Ronaldo broke numerous goalscoring records at Real Madrid but despite playing every minute in Juventus' Serie A campaign he is yet to open his account, failing to find the net in his first three league games. It isn't through lack of trying, as he has attempted 23 shots in those matches, more than any other player in European football. But teams have been well organised against him and have prioritised closing down the spaces he'd like to play in. Generally, Ronaldo has been performing well in other areas, though. His ball retention skills and physical prowess have been particularly useful to help Juventus to three wins out of three. Throughout the three games, he has been at the forefront of Juve's attacking flow - being their most fouled player with six free-kicks won - while also co-operating to the offensive build-up with an average of 35 passes per game, and creating eight goal-scoring chances, including an assist against Lazio. Where does he fit in Juve's system? Unsurprisingly, Max Allegri wants to play Ronaldo as a striker, as close to the opposition goal as possible - a philosophy which was explicitly confirmed when three weeks after Ronaldo's arrival in Turin, Gonzalo Higuain was offloaded to AC Milan. But Ronaldo's tactical versatility means he can go back to playing on his previously familiar left-wing position, as he did in their last two matches against Lazio and Parma, allowing Allegri favourite Mario Mandzukic a way back into the line-up at the expense of Paulo Dybala. Ronaldo's interchangeability with the Croatian is key to the team as Allegri still finds his side in experimental mode, trying out different formations to see what suits best his stellar summer signing. Italian media are anxiously waiting for Ronaldo to break his duck, with the nation's footballing spotlight pointed in his direction. Italy legend Alessandro Del Piero says the former Manchester United man will show his worth when the fixture list thickens. "[The Italian] defensive systems are among the best in the world," he told Sky Calcio Club. "The box gets crowded, and if he drops deeper he can find a bit more freedom. At this time he needs to adjust to it. "It will be different in the Champions League - more teams will want to retain the ball and there will be gaps opening up that he can use to hit on the counter." Ronaldo isn't getting the rub of the green at the moment - but we'll all be fresher after the break and that's when the real season starts. Sky Italy pundit and former Italian international Giancarlo Marocchi added: "He enjoys the attention of the opposing defenders and as a result it benefits all the other team-mates. What's important is that he still manages to be decisive, the goals will come eventually." It is a view that Juve boss Allegri shares: "He's not getting the rub of the green at the moment - but we'll all be fresher after the break and that's when the real season starts." 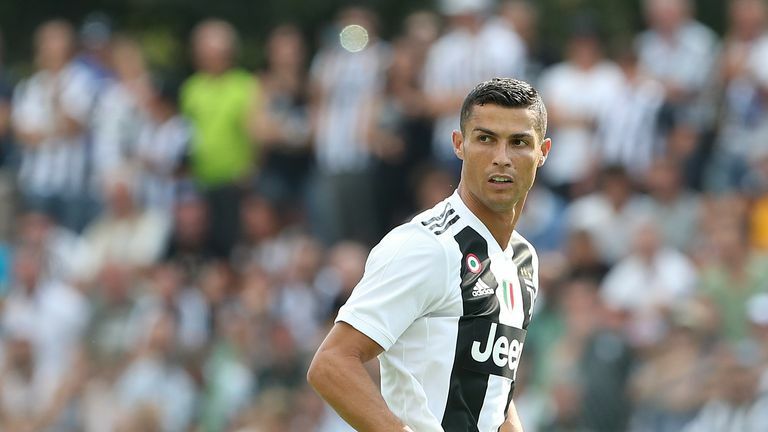 Ronaldo has already missed Portugal's friendly with Croatia and remains in Italy to polish up for Juventus' next league game against Sassuolo on Sunday, September 16. He will hope to find that elusive goal then, before heading off to Valencia the following Wednesday to start his bid for a fourth Champions League win in a row.